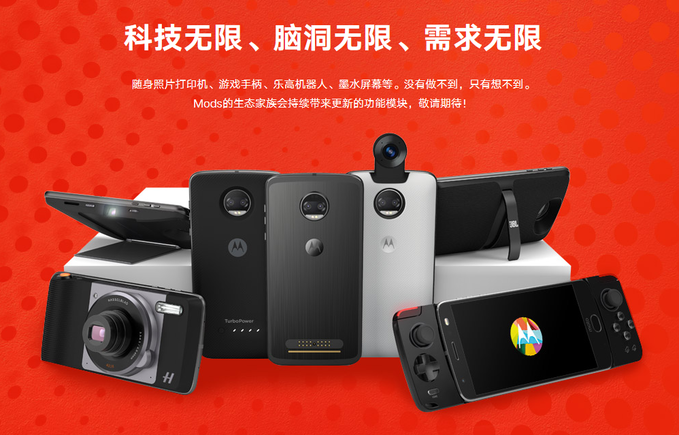 Moto Z2 and New MotoMods Launching on July 25 Hints Motorola China - Playfuldroid! Motorola has confirmed that it would be holding an unveil event on July 25. Speculations have been claiming that the Moto Z2 flagship would be getting unveiled on the said date. Now, the official website Motorola China has posted an image of the Moto Z2 which confirms that the flagship will indeed get unveiled on July 25 along with new MotoMods. As It can be seen above, the Moto Z2 can be seen sitting at the center in three color variants like black, dark grey (or silver) and white. A couple of MotoMods such as the rumored Hasselblad True Zoom Camera, Portable Photo Printer, Turbo Power Battery Case Mod, 360 Camera, JBL Speaker and the GamePad can be also seen in the image. The Motorola Moto Z2 is expected to feature 5.5-inch AMOLED screen supporting Quad HD resolution of 2,560 x 1,440 pixels. It would be running on Snapdragon 835 SoC and 4 GB RAM. It is expected to come in a single storage version of 64 GB. The rear-facing dual camera module is expected to feature a 12-megapixel sensor+ a 5-megapixel sensor. The frontside would be featuring a 5-megapixel snapper. Xiaomi Redmi Note 5A Arriving as Lower Edition of Redmi Note 5?